I have a lot of catching up to do this month! Sorry for the lack of posts but I just finished this up this afternoon. It is an update of an old drawing, just something shiny and refreshed to take to car shows, add to the portfolio and hang on the wall. 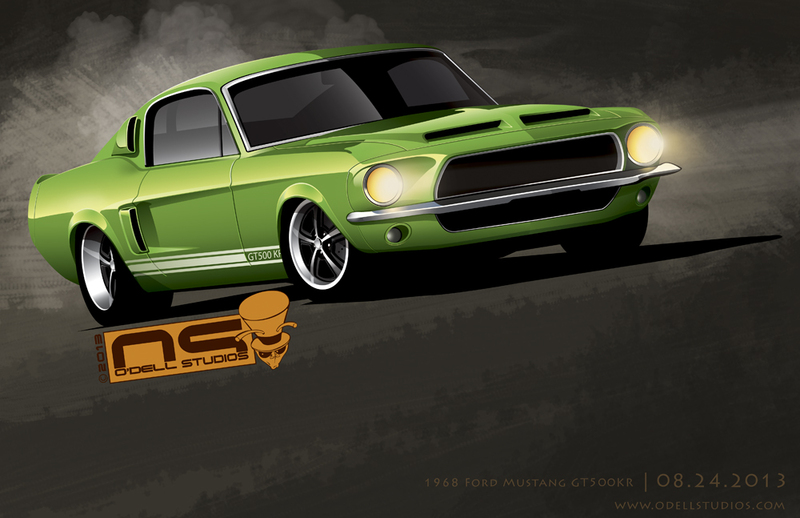 It is of course a 1968 Ford Mustang Shelby GT500KR with some mods here and there. You can probably find the original somewhere in my slideshow but I touched pretty much everything and did just a few effects in Ps to bring it to life. I am definitely focusing more and more on giving my drawings more life because I've realized that cars are about more than looks - they are also about motion, sound and light. I'm not certain I can pull off the sound part but I think maybe if I can convey more than a flat image of a car, the rest will be pulled up from the viewer's memory. As children, it wasn't ever an issue. We could produce all the sound and power and all the things that thrilled us about cars with our mouths and Hot Wheels. Not much has really changed for me. As a drawing comes together my mind is still making the engine roar and the tires squeal. Artists I think, are not seen behind the wheel, but watching from a distance like a movie director trying to capture the emotion and imagination cars have inspired for decades.